The Hilton Head Island Wine & Food Festival presented by Publix kicks off six days of events on Monday, March 7th, and continues until Saturday, March 12th. The festival began as a simple table at an event promoting Hilton Head as more than just a beach and golf destination. Three decades later, that table has grown into one of the most anticipated and celebrated festivals on Hilton Head Island. Wine lovers from around the world look to the festival’s international judging as an opportunity to identify the best bottles in the industry. 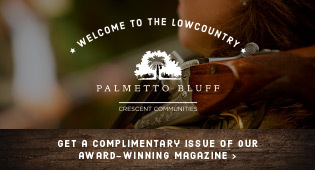 Food lovers and attendees appreciate the blend of plentiful wines, delectable foods, and Lowcountry culture. Locals appreciate the festival, as it provides them the opportunity to interact and directly participate with renowned wine and food connoisseurs from Italy to California, many of whom come to experience The Grand Tasting’s selection of over 100 high end wines. While there is much ado about the festival’s premier event, The Grand Tasting, it is often easy to overlook the entire week’s activities and celebrations. Residents in the know often prefer the more intimate settings, and unique experience of the knowledge sessions to the hustle and bustle of tastefully tasting dozens of wines at the Public Tasting on Saturday. The festival’s first event is Wine & Cinema, featuring, “The Year of the Comet” at Custom Audio Video in Bluffton. Take some time to sit, relax, and enjoy specialty wines available before and during the intermission of the film. Feel free to arrive hungry, too! Enjoy a timeless classic while sampling heavy appetizers from acclaimed local restaurants. Do you know how to compliment your meal with the perfect bottle of wine? “Zing,” Food and Wine Together, is a crash course on how to create legendary combinations to make your plate pop. Impress friends and family after attending this introductory course on the chemistry behind why some pairings work, and why some do not. An absolute favorite among our local winebibbers, this event sells out fast. Feeling creative? Wednesday’s Wine Maker for a Day gives guests the opportunity to create their very own wine using what they have learned after a day of practice. Think you have what it takes to create a masterpiece from scratch? In the end, your groundbreaking blend will be judged, and you might be crowned 2016’s Wine Maker for a Day. Who knows, after becoming the King or Queen of winemaking, you may discover your true calling. After the excitement of the previous day’s activities, most guests are craving a day to relax, and take things at their own pace. The “Sip and Stroll” is like a pub crawl, offering the opportunity to stroll along Hilton Head’s scenic Harbour Town Yacht Basin. Past attendees have described this day as one of their absolute favorites, offering an intimate look at the community behind the Food & Wine Festival – not to mention plenty of opportunities for photographs with the iconic Sea Pines Lighthouse. Following Friday’s Grand Tasting and specialty master tasting event, Saturday’s concluding event is a gathering meant to bring the entire Wine & Food community together for one final hurrah! Experience over 250 types of wines (note, best not to try all of them), and cheer on your favorite chef in the Sysco Outdoor Gourmet Challenge, and a Waiter’s Race! Win something special from Mike Reichenbach Chevrolet, who in 2015 gave away whiskey rocks andwine glasses, and sit back and relax in the Timeless Interiors VIP area if you splurged ahead of the Public Tasting. The VIP area offers a few special snacks, some unique swag, and a few wines that are not available elsewhere at the event – along with an elegant lounge area to find respite or get a little business done. 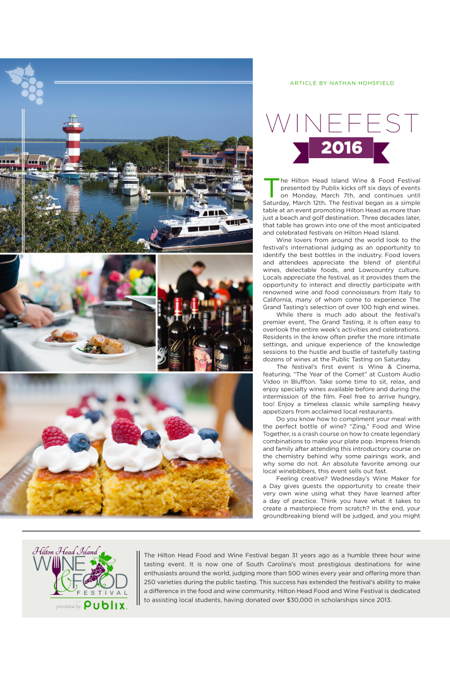 The Hilton Head Food and Wine Festival began 31 years ago as a humble three hour wine tasting event. It is now one of South Carolina’s most prestigious destinations for wine enthusiasts around the world, judging more than 500 wines every year and offering more than 250 varieties during the public tasting. This success has extended the festival’s ability to make a difference in the food and wine community. Hilton Head Food and Wine Festival is dedicated to assisting local students, having donated over $30,000 in scholarships since 2013.